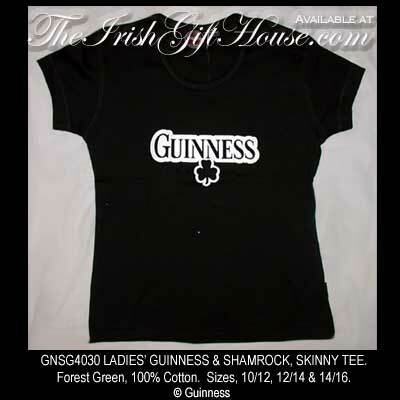 This Guinness t-shirt is for a woman and it features a Guinness and shamrock design. This women's Guinness t-shirt features Guinness branding that is enhanced with a shamrock. The 100% pre-shrunk cotton Irish t-shirt is forest green with white print and is available in the following junior sizes: 10/12, 12/14 and 14/16.